The Farmer has built a new pen but the Little Friends don’t know who it is for. Penny Pig and Hilary Horse are trying to guess what the Farmer will bring home with him to put in the new pen. Even Freddie Fly has a go and thinks it will be a new tractor. Everyone is guessing. 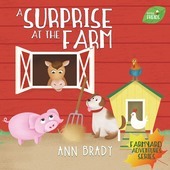 When the Farmer returns home the Little Friends are surprised to see… You need to read the story to find out. Do you think you know who it was?